You can restrict access to a web folder on your server. 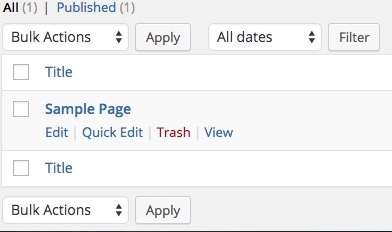 The only requirement is access to your WordPress dashboard. Before you start, you will need to have the directory you wish to password protect. If you have not, you will need to create it via FTP or using the File Manager in your Grid Control Panel. 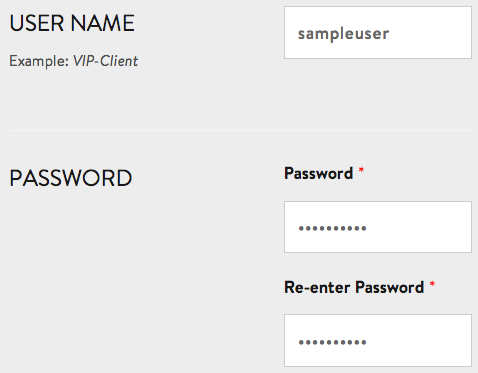 Before you start, you'll need to have handy your FTP user login credentials for your subscripton. 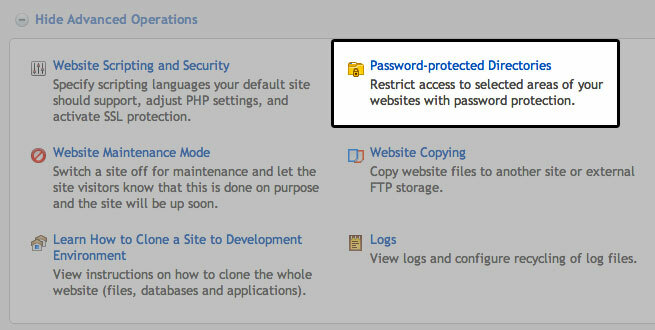 The WordPress dashboard makes it very easy to restrict access to particular pages. 1. 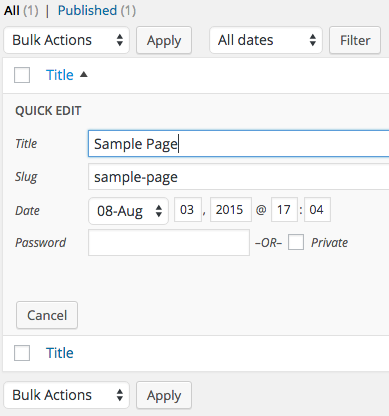 Start by logging into the WordPress dashboard. 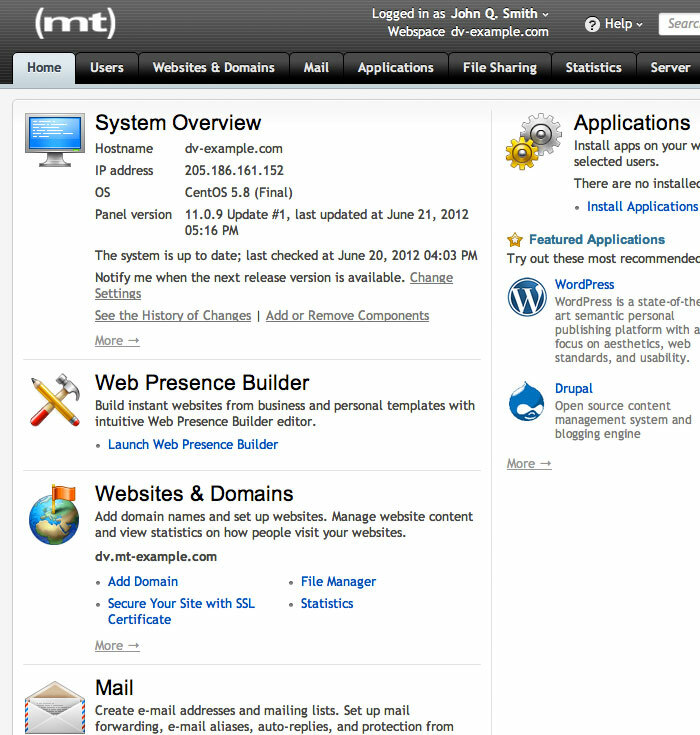 You can do this via the Media Temple account center by selecting WP ADMIN, or by navigating to yourdomain.com/wp-admin. After logging in, select Pages from the menu on the left. 2. hover over the page that you would like to protect and select Quick Edit. 3. Locate the password field and type in a password for the page. Alternatively, check the private box to prevent anyone but admins from viewing a particular page. Click on Password Protect Folders. Click on the ADD A NEW WEB USER button. This user only applies to your password-protected folders. 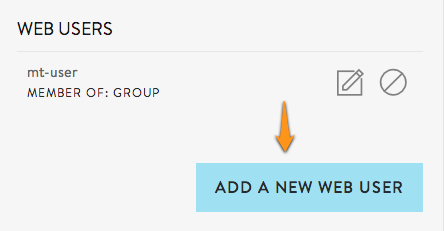 You may also assign a user to a group, if one has already been created. 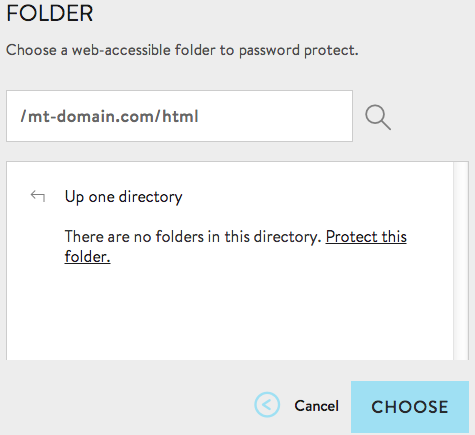 Click SAVE and continue onto create a Web User Group and Protected Folders. Click on ADD A NEW WEB GROUP. 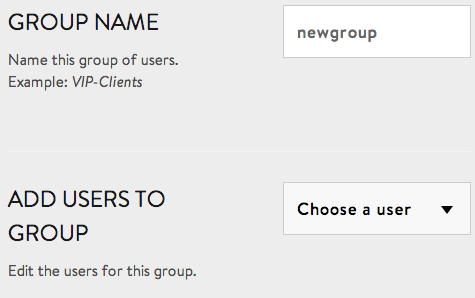 Choose your group name and add users to your new group. Group Name: Name for this web group. Add Users To Group: The web users that belong to this group. 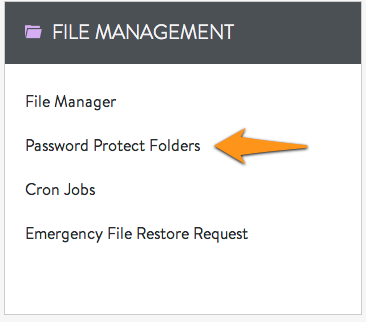 Click Save and continue on to create Protected Folders. Click on PROTECT A NEW FOLDER. Folder: Choose the path you wish to protect. Description: The description displayed to users when prompted for authentication, such as "VIP Client Restricted Area." 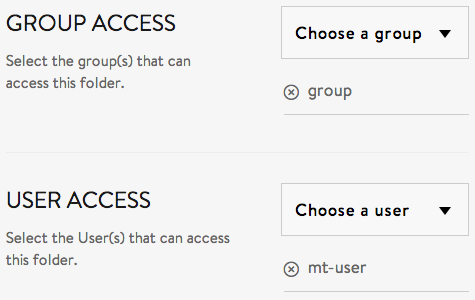 Group Access: Select the Group(s) that can access this folder. 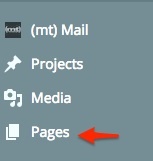 User Access: Select the User(s) that can access this folder. These screenshots are from a DV 4.0 running Plesk 11 and are also applicable to the DV running Plesk 11.5 (though some cosmetic differences may persist). If you are on a DV 4.0 and are running Plesk 10.x, please see this article for upgrade information: How do I upgrade Plesk? Click on [Manage] for the domain for which you'd like to create the password protected directory. 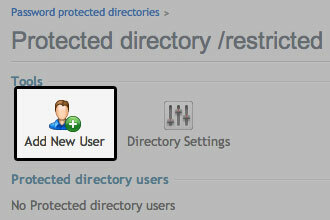 Click on the Add Protected Directory icon. Complete the form. 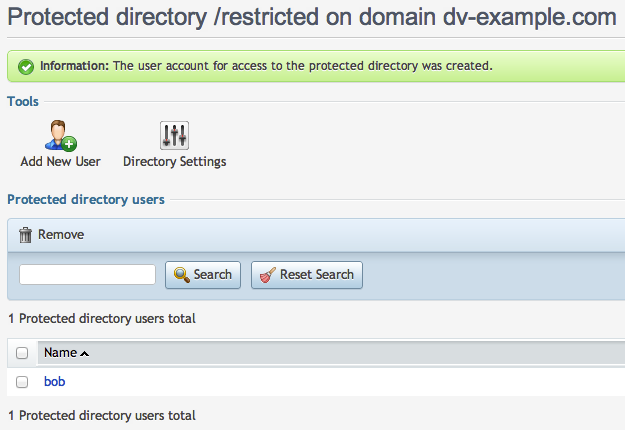 In our example, we create a protected directory called restricted, entitled Restricted Access. You will be returned to the previous page with a confirmation message. Next, we'll add a user to access the protected directory. Click on the directory you created previously. Click on the Add New User icon. Complete the form. Be sure to use a strong password. Click the OK button to save your user. You should receive a confirmation that your user was created. 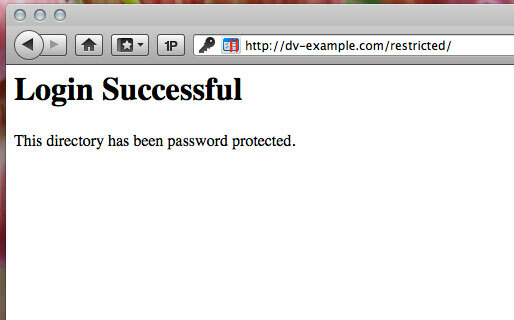 Next, we'll create a simple html document in the /restricted folder and test the password protection. Connect via FTP and upload this file to the /restricted directory. Alternatively, you can use the Domain File Manager in your Plesk Control Panel. For instructions on how to use this tool, please see this article. Point your browser to the password protected directory. 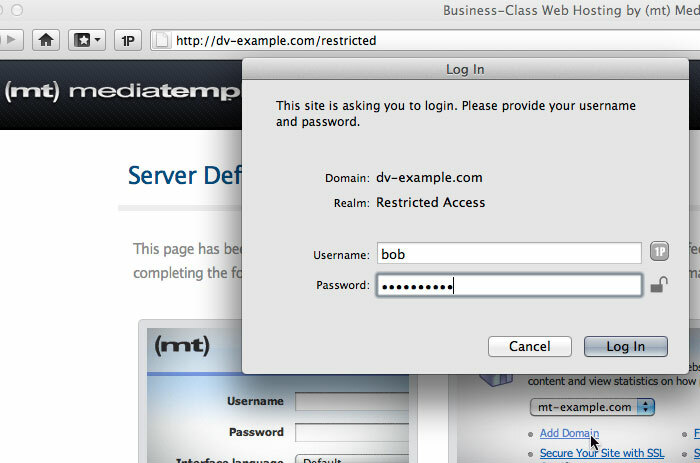 In this example, we go to http://dv-example.com/restricted/ and are presented with a login box. Enter the username and password for a successful login. This details how to use SSH to password protect web directories for your server. To proceed with these instructions, you will need SSH and FTP access to your server. Connect to the Grid via SSH. If you need help with this step, please refer to our article: Connecting via SSH to your server. Connect to your DV via SSH. If you need help with this step, please refer to our article: Connecting via SSH to your server. 2. Follow the prompts and enter the password for this new user twice.